No longer a wunderkind of the blues guitar, Jonny Lang now incorporates elements of funk, soul, and gospel into his music. Still only 26, yet with over a decade of experience and five albums under his belt, Lang displayed the spectrum of his talent to a modest rain-soaked crowd at Jannus Landing on Friday night. A persistent downpour made the audience impatient at times to hear familiar material, but Lang stood his ground, especially early on, playing tracks from his latest release, Turn Around, essentially a Christian-music album. Even so, songs like “Bump In The Road” and “Don’t Stop (For Anything),” both pulsating and funky at their core, went over well. Apparently, the message of God just comes across better with a bass line. For those eager to hear more recognizable songs, Lang eventually delivered. “Give Me Up Again,” a soulful track from his 2003 album, Long Time Coming, worked just fine alongside the Prince-penned “I Am” and the title track of 1998’s Wander This World. The climax culminated with a thunderous version of the Stevie Wonder classic, “Livin’ For The City,” with Lang howling each verse while putting his guitar through a workout. For an encore, Lang returned to where he started, with his first hit, “Lie To Me”. 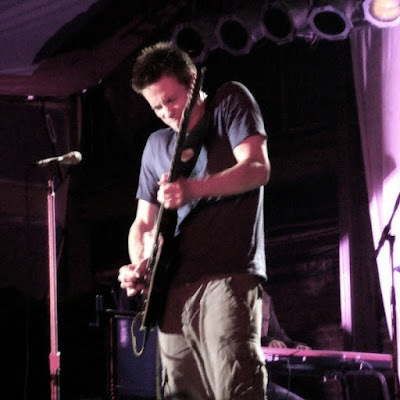 Seemingly content with not staking his career solely on his guitar virtuosity, Jonny Lang gave his fans a glimpse of his musical journey, from blues to soul, from funk to the praising of the Lord.